Air Liquide North India Pvt. Ltd.
Bhandari Foils & Tubes Pvt. Ltd.
Hindustan Coca Cola Beverages Ltd.
Jay Emm Gases (P) Ltd.
Modi Gas & Chemicals Ltd.
Poona Oxy. & Acet. Co. Pvt. Ltd.
Uttam Air Products Pvt. 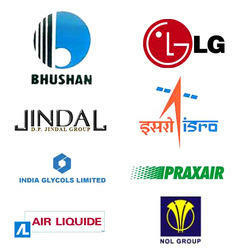 Ltd.
Vishakha Industrial Gases (P) Ltd.